10:30am to 12 Noon Pacifica time, last Friday of every month. Join fellow bicyclists, skaters, and bladers for this leisurely and spirited celebratory ride and roll through the streets of Vancouver for the first Critical Mass of 2011! Meet at the Vancouver Art Gallery on the Georgia Street side between 5:00 and 5:30 p.m. -- and roll and ride at 6:00 p.m. The ride is on rain, shine, or snow! Costumes and decorated bicycles, trailers, signs, flags, noisemakers, gettoblasters, sound systems, drums, and wildly modified bicycles are all highly encouraged! UBC riders meet at the UBC Bike Hub, on the north east end of the Student Union Building, at 4:30 p.m. for a group ride to the Vancouver Art Gallery. Phone 604-822-BIKE for details. East Van riders meet 4:00 p.m., leaving 4:30 p.m., from Grandview Park, 1200-block Commercial Drive, for a group ride to the Vancouver Art Gallery. What's Critical Mass and how do I participate? 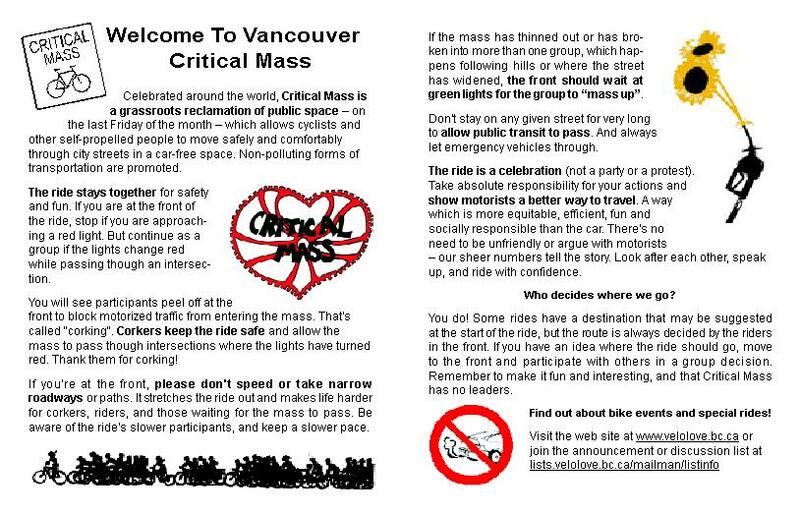 Celebrated around the world, Critical Mass is a grassroots reclamation of public space -- on the last Friday of the month -- which allows cyclists and other self-propelled people to move safely and comfortably through city streets in a car-free space. Non-polluting forms of transportation are promoted. The ride stays together for safety and fun. If you are at the front of the ride, stop if you are approaching a red light. But continue as a group if the lights change red while passing though an intersection. You will see participants at the front peel off to block motorized traffic from entering the Mass. That's called "corking". Corkers keep the ride safe and allow the Mass to pass though intersections where the lights have turned red. Thank them for corking! Never cork alone. Join lone corkers, and for intersections there should be six or more corkers. And remember, do not cork oncoming traffic in opposing lanes. If you're at the front, please don't speed or take narrow roadways or paths. It stretches the ride out and makes life harder for corkers, riders, and those waiting for the Mass to pass. Be aware of the ride's slower participants, and keep a slower pace. If the Mass has thinned out or has broken into more than one group, which happens following hills or where the street has becomes more lanes, the front should wait at green lights for the group to "mass up". Don't stay on any given street for very long, so that public transit can pass. And always let emergency vehicles through. Please don't ride on sidewalks or in opposing traffic lanes. The ride is a celebration, and an alcohol/drug free event. Take absolute responsibility for your actions and show motorists a better way to travel. A way which is more equitable, efficient, fun and socially responsible than the car. There's no need to be unfriendly or argue with motorists -- our sheer numbers tell the story. Look after each other, speak up, and ride with confidence. Who decides where we go? You do! Some rides have a destination that may be suggested at the start of the ride, but the route is always decided by the riders in the front. If you have an idea where the ride should go, move to the front and participate with others in a group decision. Remember to make it fun and interesting, and that Critical Mass has no leaders. A special note to those at the front: It becomes unsafe for those in the rear if the Mass strrrreeeetches out, there are big gaps, or the body of the Mass looses it's tail. If the front can no longer see the rear, or the Mass has just passed through a "choke point" -- stop at an intersection where there's room for the entire Mass to completely bunch up again (and where the front of the ride can see the rear again). Come to the 14th Annual General Meeting of the Vancouver Area Cycling Coalition (VACC)! The election for the 2011 Board of Directors, as well as the organization's direction and policies get decided here! Be part of the process. If you would like to come by bike, please join the President's Ride, departing from the gazebo at Science World at 12:15pm. You can also meet the group at the Seabus for the 1:00pm ferry. Come on out in support of bike fun, meet other Vancouver fun lovers, and dance to some great bands! Doors at 8pm, show at 9. Vancouver Cycling Families is a new organization that wants to provide fun and entertaining reasons for families to explore and discover Vancouver's cycling infrastructure including the new dedicated bike lanes downtown. Bring the kids, Mom & Dad, Grandma and even the dog to this celebration of our new family safe access through Vancouver. Join us the last Sunday of every month to show your support. Meet other cycling families and help us spread the word as we put a new face on the cycling community. Fossil Fools Day is a day where citizens unite to say no to the oil pushers and demand a break from our addiction to oil -- an addiction that threatens our environment, our economy, our health, our sports, our workforce, and leads to war and conflict around the world. Adopt an automobile dealer near you. Hold your own Oil Addicts Anonymous Meeting. Pass a Green Fleet Resolution on your campus or community. Fight for efficiency & renewables on your campus or in your community. With routes of 25, 50, and 100 km, the Pacific Populaire is Greater Vancouver's first major public randonneur ride of the cycling season. Since its inception in 1986, the focus of this event has been to encourage participation by all cyclists regardless of fitness level, cycling experience, or age. Cost is $10 children, $15 members, $18 non-members. If you haven't signed-up yet, on ride day arrive before 8:00am to avoid the crunch. "Randonneur cycling", sometimes called marathon cycling, for some is touring with miles and miles of scenic riding, often at a leisurely pace. For others, randonneuring is a quest for higher speeds and faster times often working together with other similar-minded riders in pacelines. At Heritage Hall, 3102 Main Street at 15th Avenue in Vancouver. At that meeting, members will be elected to BEST's Board of Directors. BEST is one of the region's most active and clear voices for sustainable transportation choices. Since its inception, BEST has grown from a small activist group to an organization that works with governments, educators, youth, workplaces and community groups to bring about the changes that will contribute to a better quality of life for people and communities in the Lower Mainland. Innovative BEST programs include AutoObesity, The Bicycle Valet, and Bike Month. Enjoy the splendour of Vancouver's unique cherry blossoms via bike rides that weave through various neighbourhoods in bloom. Rides are self-guided and free. There are over six rides with each ending at a community celebration at MacLean park where you can picnic with your family and friends, get your bike washed, or just relax. Neighbourhood rides include Downtown, West End, and False Creek (loop a), Shaughnessy and Queen Elizabeth Park (loop b), Mt. Pleasant (loop c), Grandview - Woodland (loop d), Arbutus - Dunbar (loop e), Oakridge (loop f), and Kensington - Victoria - Killarney (loops g & h). Velopalooza is 17 days of bike fun with events most organized by individuals. Bikers of all persuasions are likely to find many events of interest and nearly all events are free. Do you have an event or ride you know about or could put on during Velopalooza? Add it to our calendar at www.velopalooza.ca. Events on Velopalooza's calendar will be published and promoted by Velopalooza. Bike route remains unplowed or uncleared?